Magic Green Sauce? Made with all green foods // whipped up in five minutes // eaten every day for the rest of my life. I’ve been just WAITING for the right time to share this sauce, and by waiting I do definitely mean hoarding. Friends, readers, good sauce loving people of the world: let me introduce you to 5 Minute Magic Green Sauce. 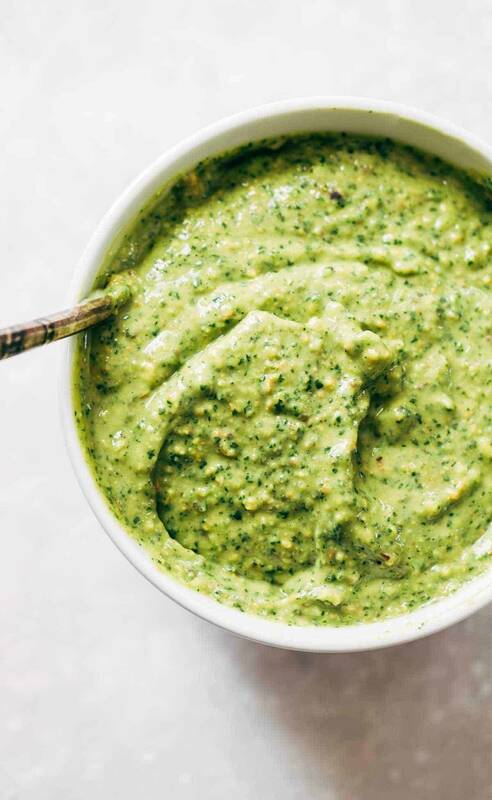 Loaded with avocados, garlic, parsley, cilantro, olive oil, jalapeño, lime juice, salt, and pistachios, it might be my favorite sauce (read: dressing, marinade, dip, spread) I’ve made ever ever ever. It’s reminiscent of guacamole just because of the avocado-cilantro-lime thing, but the parsley, the pistachios, and the olive oil keep it from being decidedly Mexican in flavor and make it compatible with, I mean, literally, everything. Salads, chicken, chips and crackers, sandwiches, dipping vegetables, you name it. 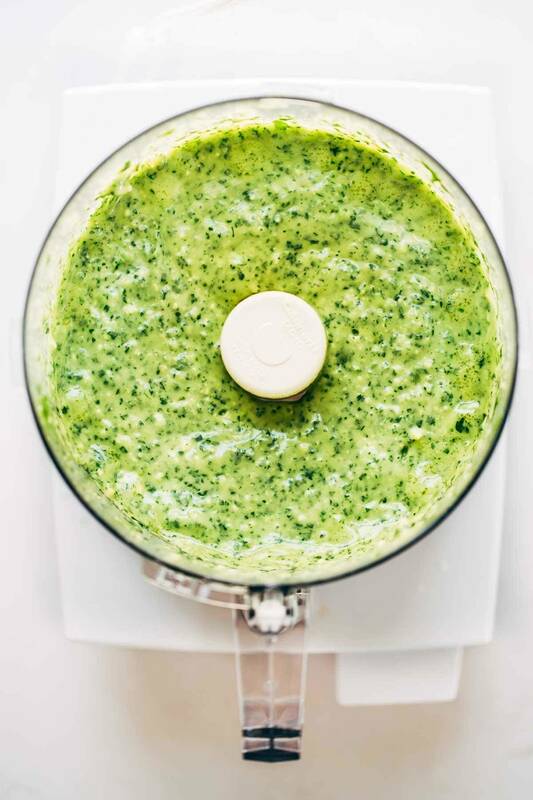 This Magic Green Sauce is adaptable, quick, extremely yummy, and generally the love of my life. It can be anything: dressing, sauce, spread, dip, marinade –> you name it. It’s going on everything I eat this week, from salads to quesadillas to just straight up chips and crackers. It has me licking out every last corner of my food processor and then telling people about it on the internet. Time out for a second. I recently did a reader survey (check it here if you didn’t get a chance to say your piece) and one or more of the comments I got on the Least Favorite Things About Pinch of Yum section was something like this: you make it sound like everything you make is your favorite thing. Friends, I hate to be predictable, but I’d like take this moment to say that THIS SAUCE RIGHT HERE is my favorite thing. To anyone who was concerned about my too many favorite things, your concerns are valid. I can almost promise you that I will probably have another **FAVORITE** thing starting in, like, two seconds when I do my next recipe post, but that’s kind of my job, right? To find all the food favorites and share them, like this one, which currently tops the list for the Recipes I Actually Make More Than Twice category. 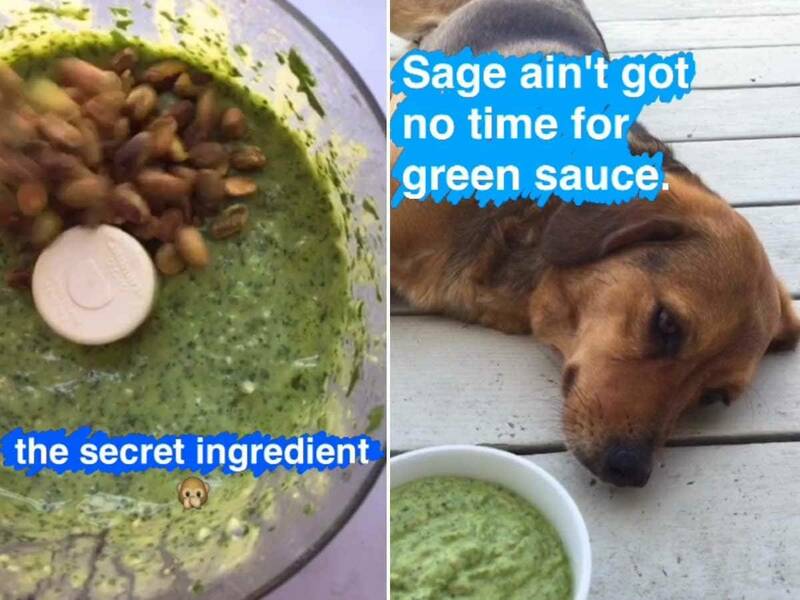 I’ve already made this sauce an inappropriate number of times since it first came to life last week and I am not even going to tell you how many full mason jars I have of this in my fridge right now from a Magic Green Sauce Snapchat session frenzy with an excited Sage yesterday (okay fine 3). Which reminds me, how surprisingly fun is SnapChat?! I was once a hater, so if you’re grumbling under your breath right now, I get it. I do get it. But get over it and come hang out with me and all the preteens! If nothing else, FOR SAGE. If you are following me on the SnapWorldUniverse (search pinchofyum!) let me just say, you are so kind and patient. I have zero percent of a clue what I’m doing and yet somehow it feels okay and maybe even fun to do these dorky, unpolished little videos of food and life and Sage and share them with my SnapFriends. <— Is that the right way to say that? I’m almost 29 which is almost 30, okay? Just let me be old. A few of you have even snapped ME pictures of your Pinch of Yum dinners and/or recipe questions. Like, sent them directly to me. And I might have squealed and run into the next room and told Bjork about it in detail because social media makes me cray like that. And just like that, you have yourself an Everything Sauce. 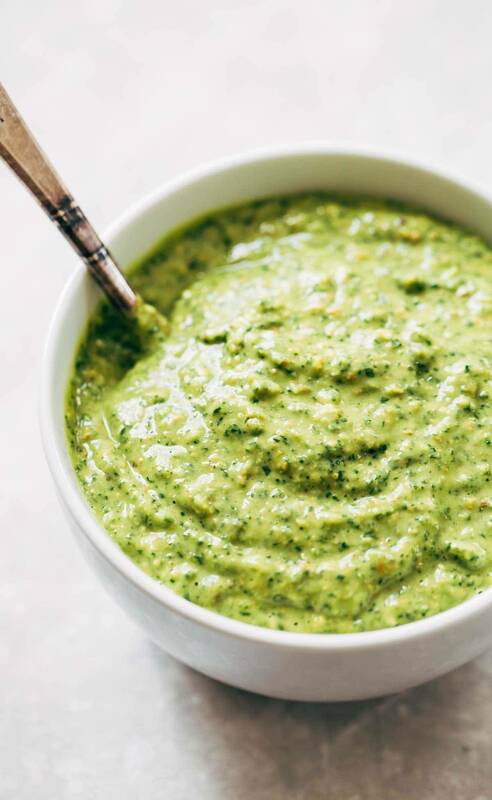 A 5 Minute Magic Green Sauce that can be a dressing for your favorite salad or a sauce for your chicken or a rockin’ chip dip for that party you’re hosting tonight with you, yourself, and your sweats in front of the TV. Oh my word, you’re doing one of those, too? WE’RE TWINS. It’s totally by accident that this magic green sauce is vegan (!! ), but I’d say that’s a pretty happy accident. And all’s right in the world. 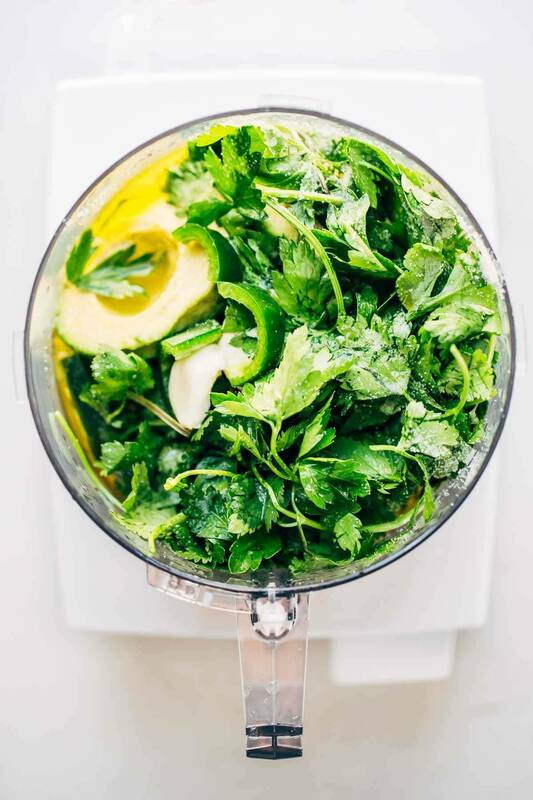 5 Minute Magic Green Sauce – SO AWESOME. 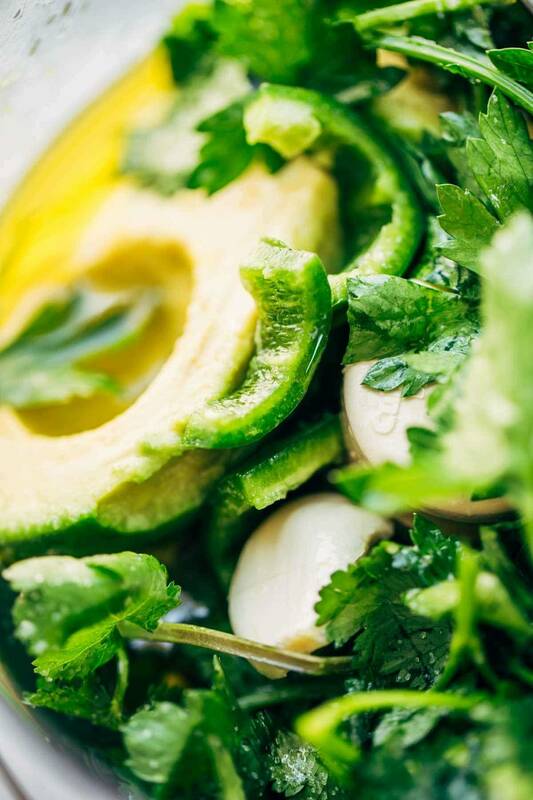 Made with easy ingredients like avocado, olive oil, cilantro, lime, garlic, and parsley! Vegan. Pulse all ingredients – except pistachios – in a food processor until incorporated. Add pistachios and pulse until mostly smooth (depends on what consistency you want). Serve as a dip, spread, or sauce — or add additional water or oil to thin the sauce for use as a dressing or a marinade. I did make this with other types of nuts like walnuts and almonds and it worked just fine, but the taste wasn’t as good IMHO. If you can find shelled pistachios, it’s worth the splurge! “I have to be true to The Food Feelings.” I’m laughing pretty hard over here. I like to say that my favorite food is the food that’s in front of me. 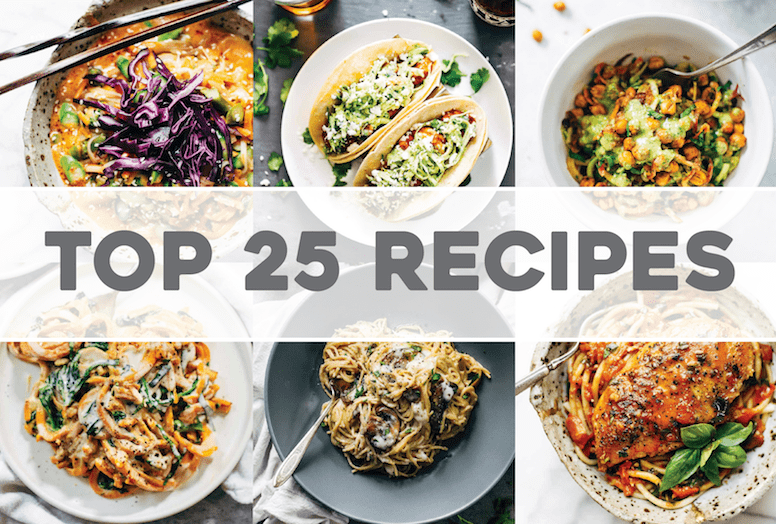 Who could pick when there are so many jaw dropper recipes out there?! Having 90 favorite things is beautiful, not annoying! I digress, this looks amazing, and I want to put it on everything. Thanks for sharing! I couldn’t agree more! I find it endearing…and ultimately what keeps me reading. Because why would I want to read a blogger who doesn’t LOVE all of her food? Question — I am one of those cilantro haters…think this would still be okay with, say, a little more parsley and absolutely NO cilantro? Just wanted to update this for all the other cilantro-haters out there to say I made it with just parsley and it’s still AMAZING. YUM! Can also use kale, tastes great this way! Before you kick cilantro to the curb think about the taste you are leaving behind. I do not like the smell of cilantro but once it is incorporated into a dish all that changes. I like it. This is seriously awesome sauce! Made it with almonds instead of pistachios since I couldn’t fun any pistachios decently priced here in Hawaii. 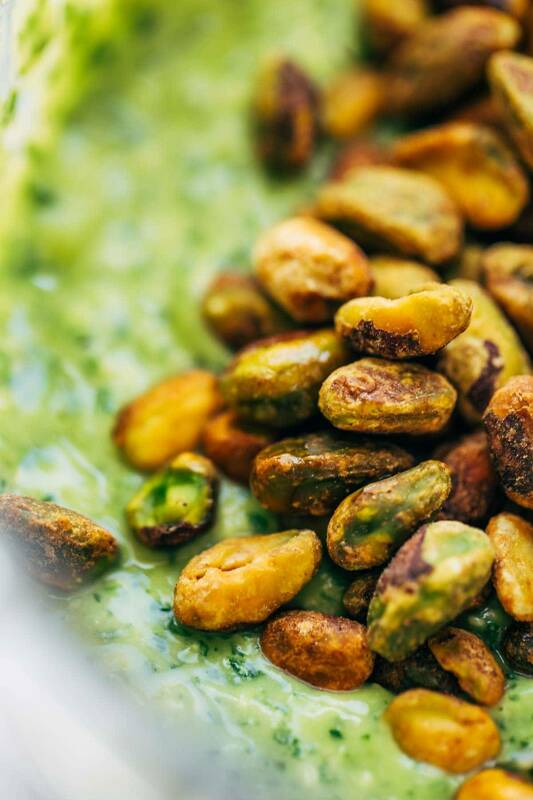 It’s a creamy take on chimichurri with a bit more texture from the nuts. Put the extra in ice trays and the sauce froze and defrosted nicely. Will definitely make this again! thank you!!! just the info i was hoping to find !! and the sauce was Perfectomundo with lentil quesadillas. THAT GREEN IS GORGEOUS! And five minutes!? Um, sold. Perfect for a busy life! Fair warning: I have had lotsandlotsandlotsandlots of coffee. I have to that you saying everything is your favorite is TOTES my favorite. Totes. This is magical. Those pictures are magical. You should write a book or something (ha). Lindsay, your green sauce looks so beautiful, healthy and delicious!! And easy to prepare! I can’t wait to try it soon for a dinner party. Looks great! I’m imagining using it for a chicken salad base! This green sauce looks delicious! I make a similar recipe and love adding it to zucchini and cucumber noodles! Hi Lindsay, I forgot to ask you, how long does this keep in the fridge?? Just a few days! After that, the avocado starts to brown too much. You should /can you please add average keep time /how long it will last in the fridge / if it’s suitable for freezing in the recipe. I’m cooking for 2 but love leftovers and so would love to know if it would keep, and for how long. Thanks ! I bet it won’t even be around one night, it’s THAT good! This looks super good. This seems like it could be good over Indian food. I have an OBSESSION with the green sauce at Brasa. Have you been? I think you would LOVE it. Their green sauce is mayo based. Anyway, please scope it. My 3 year old begs for the black beans and yellow rice. I’m getting hungry just thinking about it. I have been to Brasa – and yes! YUMMY! What’s your snapchat? I’d love to see some of these cool food videos! I can totally imagine this becoming my new favourite sauce as well! Lindsay – this sauce looks fantastic! I have one challenge – I am allergic to avacados 🙁 Do you think there is anything I could substitute? Hm, let’s see. What about like edamame or something? I know that sounds weird but I’ve actually used that in guac when I’ve been short on avocados and it’s worked surprisingly well! Amazing!!! I’ll definitely try that – thanks for the advice!! I’m a San Diegan with an avocado allergy, so I feel your pain. I saw this recipe and it looks amazing, but can’t have the avocado either, so I perused the net and found this website with a slew of great avocado substitute ideas, depending on recipe. You should totally check it out. I would think that hummus would be a good substitute for those who are allergic or dislike avocado. A lot of similar sauces use Greek yogurt, it would be quite different but that could get you the creamy texture! This looks amazing! How long does it stay good in the fridge? Hey Meghan! I’d give it about three days. It might need a little stir to stay smooth but it shouldn’t brown or anything. Yep! Other readers have had good success freezing this sauce. I’m in such a saucy mood right now, and I’ve been trying to look for more recipes to sauce up my foods. I totally believe you when you say this sauce is one of your favorite things. Quite frankly, I have a million favorite things too! If Oprah can pull it off, so can we! This looks amazing, Lindsay! And I hear ya with the whole everything is your favorite thing. I like everything I put on my blog and a lot of the dishes are my favorites. Otherwise, why would I put them on there? “Here’s a chicken recipe that’s just so-so, but you gotta try it!” 🙂 Haha. But this green sauce really does look and sound magical. I love that you can put it on anything. Can’t wait to try it! I have to say, I love the way you write. You were legit fangirl-ing out over this sauce and I love it. Definitely want to make it now! Omgahhh this sauce looks absolutely heavenly. That green is so vibrant. Would have never thought to load it up with pistachios. And that snap of Sage was too good. She just wasn’t even gonna try to pretend to have it. Such a cutie pie! Right? She’s like, mom, I’m over this game. This sauce looks fantastic — excited to try it. The spring is hectic for me between family, teaching, and coaching, so I try to make big food prep batches on a Sunday. How long do you think this would keep in the fridge, and do you think it would freeze well? This is a fantastic recipe, thank you! How do you keep it from turning brown? Made it for a party and it was brown after a few hours. Can’t imagine it will keep for long in the fridge. The colder you can keep it, the better! And if you’re able to keep it covered. It will also brown faster if your avocados are really really ripe. That sauce looks amazing!! Love the pistachios in there! And Sage is such a beauty. We have a beauty too, Dizzy, even though he’s a boy, he’s still a beauty. Don’t you just love having a dog!!! So basically it’s a guacamole-chimichurri-pistachio pesto rock your taste buds sauce 🙂 Well done Lindsey! Oooh dippable gauc! With Nuts! But not any nuts – my FAVORITE nuts! Looks great! Thanks for the nutriti0n label, but what is the serving please? Hey Teale! It’s listed at the top of the recipe – about 1/4 cup. Does it heat up well? I want to add it to pasta for a meal this week but wasn’t sure how well it heated!?! Thanks! It can definitely be heated up a little (I wouldn’t simmer it on the stove, but tossed with some hot pasta would work fine! ).